zoom in with the Camera: the Chevy bow tie logo is in the middle of each hubcap. update of the Hermes, installation instructions, etc. I like "Vice City," so I usually don't want parts of it already done for me. er save game for v.1. Penh '86," after which I had Tommy go on another ammo run. quent saves on. You might consider the second one a belated starter save. it before they make those changes. include his 1957 Chevrolet Bel Air two door hard top mod with this package. the original versions, and installation instructions. the save slots you prefer. to Rubino's restaurant), further south to the Vice Surf billboard for a S.P.A.S. use before have probably reappeared or are about to reappear. Rampage or the weapon you had in that slot will be gone afterwards. to the north, the stairs up to the Skumole Shack are on his left. roads that extend south from the two most northern blocks of the west island. case you want to use the optional modded handling.cfg. which is where the "EP" Admiral is stored. colors you don't normally find in the game, too. 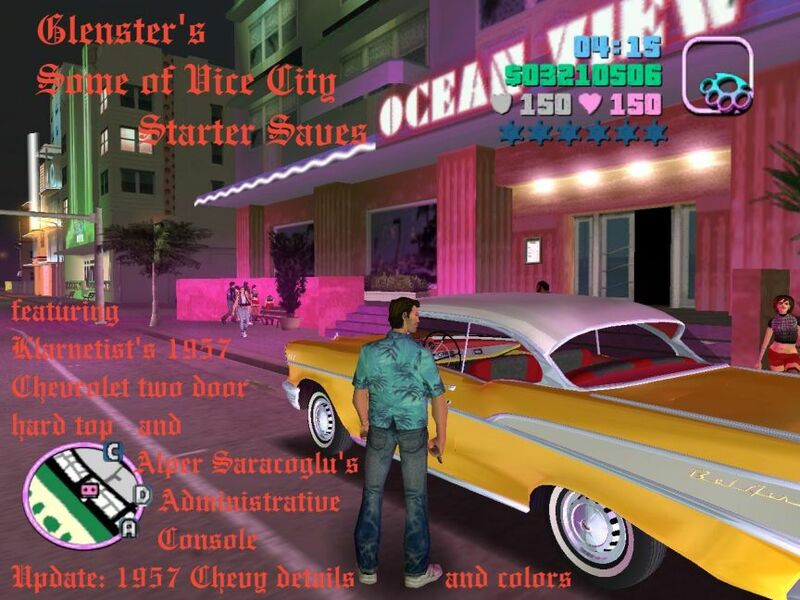 the second save game--everything else was done with an unmodified "Vice City." - a super Sentinel for "The Driver" and the "Sunshine Auto Races,"
the RC Bandit handling code). this handling file change causes that vehicle to appear on nearby land or not. wrecks makes all the vehicles of that name that way. and then, so I'd leave column Y at 0.00.
bar, The Greasy Chopper, but the competitors' bikes won't wreck. have a red dash, ceiling, etc. Nice updates Glenster, believe it or not I still have VC installed. Whenever I restarted the game the most annoying thing to me was the Firetruck missions being canceled for no apparent reason. Vigilante was fun with the Hunter unless the game glitched out then it was a waste of 45 minutes! I might just have t check it out. Update 12/14/2010: I added Alpert Saracoglu's Administrative Console. a few details to some of the instructions here and there. in the default.ide file in the "1957ChevroletBelAir" folder. better on the grill of the '57 Chevy mod. favorite '57 colors for the Chevys with a Pay 'n' Spray. Onyx Black a bit lighter. to some of the instructions here and there. hands are closer to the steering wheel. and the black of the engine changed to dark gray. driver's door so their hands are at the steering wheel. mined by a color in the .txd file. tion (that features the Bel Air logo) of each tail fin. part of the .txd file. permission from the original creator."